Ragi (or Finger Millet) is a healthy and nutritious grain that is rich is minerals, gluten-free, iron and protein. This is a delicious & healthy variation to the regular dosas and can be served for breakfast or evening tiffen. 1. Heat a large pan of water over medium flame. 2. Add all the jaggery and stir until fully dissolved. 3. When it starts to simmer, remove and strain this liquid. 4. Combine the ragi flour, rice flour, coconut, cardamom powder and salt in a large bowl. 5. Gradually pour the jaggery syrup and mix well to a dosa batter consistency. 6. Heat a dosa tawa over medium flame. 8. Apply ghee around the edges and cook on both sides. 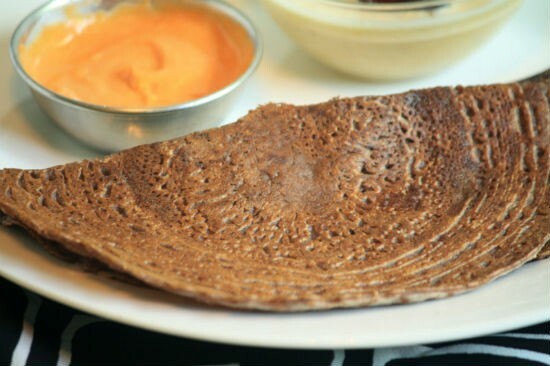 Feel free to comment or share your thoughts on this Ragi Sweet Dosa Recipe from Awesome Cuisine.